Boating may seem like an activity with few boundaries and guidelines, with boats gliding across glistening expanses of water. But even water adventures require certain parameters to make sure that everyone on the lake can both have fun and stay safe. For boat rentals, it’s likely that you’ll be required to attend a training meeting to learn the rules and regs of the water. Here are some things that you might hear at the training. Steer in the right direction. If you’ve never been introduced to boating rules, you may think that boats can zigzag across the water however they please. But this is not the case. 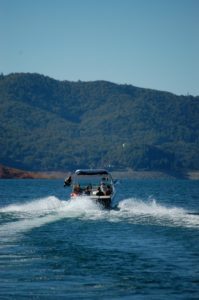 The California Department of Parks and Recreation requires that boats travel counter-clockwise, especially in the water skiing area. Just like cars, boats need to keep to the right of the water channel. There will be times, however, when two boats intersect. When this happens, boats only need to follow a simple protocol to determine who gets the right-of-way. The vessel on the right is the one that always has the right-of-way. When two boats meet each other head-on, both boats need to steer to the right so they can pass safely. These simple guidelines prevent a lot of boating accidents, but keep in mind, that there may be some untamed boaters who don’t know the rules. In those cases, you may need to give the right-of-way to avoid a collision. Did you know there are speed limits on the lake? In California, boats are expected to slow down to 5 mph whenever they are within 100 feet of an anchored boat, a shoreline, or a marina. Lakes may also post speed limits specific to their water level or other situations. On Shasta Lake, the 5 mph limit applies to certain areas when the water level goes down to 90 or 100 feet below the high water line. For open zones, the California Department of Parks and Recreation recommends a 35 mph speed limit. Drinking on a boat is free game, but drinking while driving a boat generally falls under the same laws as highway laws. Many states limit the blood alcohol content allowed for the driver to .08. It’s possible to get a BUI (boating under the influence), which is considered a misdemeanor. Getting drunk on a boat is also a danger for passengers, since many deaths occur when drunk people fall overboard and drown. The rules on lakes mostly require common sense and a steady hand. Get informed about the specific requirements for the lake you’re visiting and look out for other boaters and the passengers on your boat. The lake is more fun when it’s also safe.